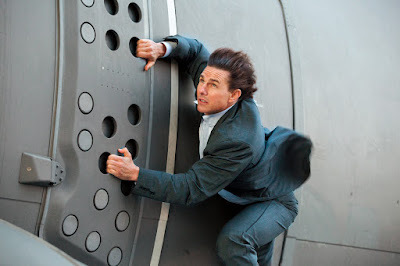 For its first fifteen years, the Mission: Impossible movie franchise was remarkable as a directors' franchise, purposely switching up helmers (and styles, characters, and even continuity) to give each installment a unique feel rather than a Bond-like house style. That all changed when Christopher McQuarrie hit a home run with the fifth film in the series, Mission: Impossible - Rogue Nation (2015), and returned to direct the sixth as well, last year's mega-hit Mission: Impossible - Fallout. Now, it appears that that wasn't an anomaly in the franchise's history, but a whole new direction. Variety reports that McQuarrie has just signed on to write and direct not just one more, but the the next two Mission: Impossible movies, which will film back to back for release in summer 2021 and summer 2022. Tom Cruise confirmed the dates--and presumably his involvement--with a lit fuse tweet this afternoon. From the perspective of the studio, Paramount, it is not a surprising move. Fallout was both the highest grossing and best reviewed picture in the franchise to date, so locking down McQuarrie makes sense. Once these movies are made, he will have directed a full half of the film series. (For that matter, by that point Cruise will have surpassed Sean Connery's and Roger Moore's tied 7-film record for the most number of times playing a superspy in a major franchise.) For Fallout, as it was the franchise's first film with a returning director, McQuarrie made a point of differentiating it visually and sonicly from his previous entry by working with a different cinematographer and composer. It will be interesting to see if he continues that trend, or settles on a house team. The latter would make sense for the next two, anyway, since the plan is to shoot them back-to-back. This, also, makes sense, as even Tom Cruise can't defy age forever, and will one day have to choose not to accept some death-defying stunt. Back-to-back James Bond movies have been rumored at various times during Daniel Craig's tenure as the secret agent, but always shot down by both producers and the actor, who say that the demands would be impossible. But impossible is, of course, Cruise and McQuarrie's bread and butter! Peter Jackson's Lord of the Rings trilogy and the Russo Brothers' last two Marvel Avengers movies famously shot back to back, both with extensive reshoots planned into the schedule for the later films. Presumably committing to what sounds like full-time Mission: Impossible duties for the foreseeable future will rule out McQuarrie as a writer/director on what Paramount is hoping turns out to be their next big spy franchise, the nascent John Clark series with Michael B. Jordan attached to topline, based on the bestselling Tom Clancy novels. Over the years, McQuarrie had been flirting with helming or directing the first picture in that series, the long-in-the-works Without Remorse. Though it's just possible that he might still be able to squeeze that in before the next Mission, since the studio has already earmarked summer 2020 for another Cruise vehicle, the decades-later sequel Top Gun: Maverick. Hence the 2021 date for Mission: Impossible 7 (whatever it turns out being called). But that scenario is unlikely, as despite the extra time, the trade reports that Paramount hope to start shooting the next Mission movie by the end of this year. (And historically there's good reason to allow lots of time. Fallout had to pause filming for several months while Cruise recovered from an ankle injury sustained performing a rooftop stunt... but still made its original release date.) And, anyway, at last report Sicario 2 director Stefano Sollima was zeroing in on Without Remorse. Now they just have to lock down the rest of the team! In the last three movies, Simon Pegg, Ving Rhames, and now Rebecca Ferguson have all become equally essential to these films' success as the star, which is only right, given the original TV series' emphasis on teamwork rather than a lone wolf secret agent. I'd also love to see Vanessa Kirby's White Widow from Fallout come back. Read my review of Mission: Impossible - Fallout here. Read my review of Mission: Impossible III (2006) here. Read my review of M:I-2 (2000) here.